Since PM Alexis Tsipras announced a referendum about whether to accept or reject Troika’s ultimatum to Greece for further austerity measures, the corporate media have sided uncritically with the Yes party. They’ve gone so far as to claim that the Greek citizens should vote YES because such initiative was a mistake. In the days leading the referendum, they couldn’t help but spew the customary panicking pro-EU repertoire. They showed queues of people at ATMs – though dressed in scarves and coats, despite it’s July. They stated Greece was undergoing a shortage of food, heralded that soon a 30% compulsory levy on current accounts exceeding €8,000 would be carried out. And way more drivel of this very mold. But for 5 years they have kept silent about Greece’s spike in the suicide count, now up to 10,000 cases, about 500,000 malnourished children, and about 3 million people with no access to healthcare, leading to a rise of stillbirths and infant mortality rates, soaring levels of HIV infection among drug addicts, and the revival of malaria after 40 years since the last time – all of it, an outcome of the EU austerity politics, which included public hospital budget cuts and halved public spending on pharmaceuticals. Of course, such stuff isn’t newsworthy at all – made-up reporting is! Greece was compelled to make swingeing cutbacks to meet the terms of the bailout packages offered by the European Commission, the European Central Bank, and the International Monetary Fund – read the Troika. Syriza Party was elected to power on January 2015 elections with an explicit mandate to put an end to austerity, and the people’s NO at the July 5 referendum is also a rejection of Tsipras’s attempt to seal an agreement with the EU and ECB based on a further program of cuts, simply to be implemented over a slightly delayed timetable. The Troika imposed austerity measures in 2010. Greeks’ salaries and pensions shrank dramatically hereinafter, and two-thirds of pensioners ended up living below the poverty line. Privatizations of the public asset involved everything and anything profitable: airport services, national banks, port authorities, post offices, water utilities, electricity, telecommunication, the prime publicly-owned real estate, the national lottery. All was quickly sold off to oligarchs and international corporations. Many schools and hospitals were shuttered for lack of funds. Five years later, nearly 26% of working-age adults are unemployed, as well as 50% of youth, with no prospect of a future. And the Troika wants more of that – more looting for Greece. On July 5, the Greek people uttered aloud a clear NO to bankers, financial technocrats, EU-bureaucrats and minions to follow. More than 61% of the voters rejected the bailout plan proposed by the Troika, which envisaged new cuts in public spending and indiscriminate increases of taxes in order to get additional financial assistance to pay off… the Troika itself! Voters dumped out the ploy. Nothing new so far. Most times, when the European citizens are called to express themselves, the schedules plotted in secret rooms by the European bureaucrats and bankers are likely to blow. In 2005, France and the Netherlands asked the opinion of the citizens to approve the European Constitution, and the NO won. Italy ratified it only through parliament. Poland, Ireland, Denmark, Czech Republic, after the results of the French and Dutch referendum, called off theirs. The European Constitution was rejected. Thus, the technocrats concocted the Treaty of Lisbon, which was nothing else but a modification of few minor aspects to the previous text. The trick was to turn a founding act, like the draft constitution, in an emendatory treaty, as if it was a mere modification of agreements already in place. This time, they eschewed asking for the views of citizens. Only Ireland decided to ratify the treaty by referendum, and the NO win. Eurocrats claimed it was to be redone. A year later, the YES won, and this time the referendum was fine. The same thing had happened in 2001 with the Treaty of Nice, concerning EU enlargement to the east. Such failed experiences led to the usual rejection of European representatives towards citizens’ opinion. Namely, towards democracy itself, regarded by the financial circles as an unnecessary complication to be relegated to the past. The representatives of the financial oligarchy were unable to conceal their resentment and hostility at the Greek referendum. Therefore, is no wonder the sort of comments preceding and following it, that the MSM have parroted daily. European Parliament Chairman M. Schulz, who previously warned the Syriza Govt to abide by the austerity agreements concluded by the past Pasok and conservative governments, had expressed his hope in a YES victory and the following formation of a government of technocrats, in order to resume the negotiations and find a reasonable deal with the creditors – reasonable for the creditors, I guess. He added also that this would be the end of the Syriza era – obviously if YES wins, the EU would require a change of government. On several occasions, Schulz did not hide his intolerance towards political entities not aligned with him, often calling “fascists” their representatives as well. According to him, Greeks’ choice to elect Syriza to power in January 2015 elections is unacceptable. Who did he mean by us, I wonder? Italian people? I guess no. The Monti Cabinet, composed entirely of unelected technocrats, lasted just 529 days and at the end of it the country’s economy was in shambles, worse than ever. Monti struck the basis of Italy’s welfare by making changes to Social Security system (like a raise of retirement age), and to work dynamics (less strict rules on layoffs and work contracts vexatious towards employees). These reforms aimed to reassure markets on the country’s financial resilience. Moreover, to ensure a sham stability of the public debt, he increased taxation, especially on house property – the fine European solutions! Damn’ right! Why should the Greek people have a voice on their fate? Being rooted so high a concept of “democracy” in the EU domain, there’s little doubt the referendum result will be disregarded, and the EU will keep its inflexible stance that the Greek debt issue must be resolved only on its own terms. Greece had been running a government deficit since 1973 and very high deficits since the early 80s. Economic development was limited mainly to tourism and shipping. There was little chance of competing in industrial production against northern European nations, particularly Germany. Greek governments used the money to provide public sector jobs, generous pensions, and social benefits. By joining the Eurozone at the rate of exchange that they did, the Greek people got a lot of Euro for their converted drachma, and thus plenty of purchasing power to buy imported consumption goods from EU members at a favorable price. Interest rates were also low, but this would not go on much longer. But Dominique Strauss-Kahn, then head of the IMF, aimed to run for France presidency. President Sarkozy warned him that French banks were the largest holders of Greek debt. If Greece didn’t pay, the French banks would go under, and German banks would follow. Then, at the 2011 G8 summit President Obama told that his major campaign contributors (primarily, Goldman Sachs) were on Wall Street, and they had made huge bets that Greece would pay. Thus, it was necessary to lend the Greek government the financial aid to pay the bondholders, so that Wall Street banks wouldn’t lose their money. Greece would be sacrificed and driven to poverty. So, the ECB and IMF decided to ignore the stats and paid over 100 billion Euro to the bond holders. From then on, Greece, instead of owing to Wall Street private bondholders, owed to the IMF and ECB. In Germany, the cost of borrowing is very low. 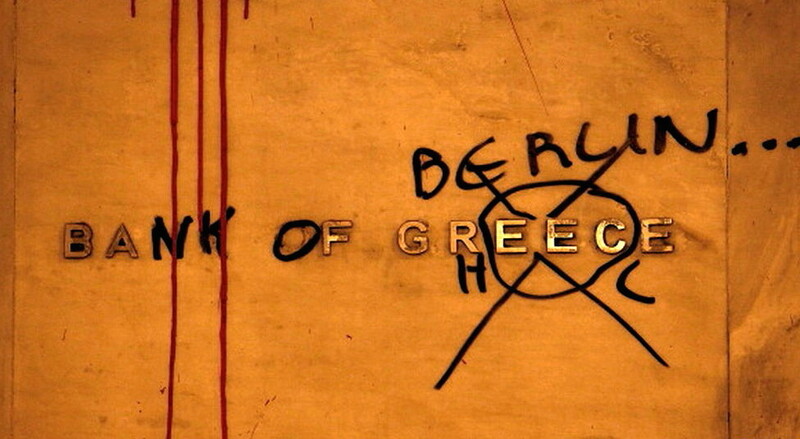 Thus, German banks collect money from German taxpayers, then they use that money to buy Greek titles. Greece, though it’s a risky country, is charged a 15% interest rate. So, it happens that from a poor country massive resources get displaced to a rich one through the difference in interest rates. By this system, as the banks make whopping profits, the poor country starts up on impoverishment proceedings. When it is no longer able to pay its debt, EU aid arrives. Russia has already taken steps to integrate Greece into the $100 billion New Development Bank, and since April, Tsipras has made two visits to Moscow, which have led to a lifting of import ban on some Greek products, and Russia’s stance to be ready to include Greece in the Turkish Stream pipeline project, worth 2 billion Euro ($2.2 billion). And the day after the referendum, a phone conversation took place between Putin and Tsipras in order to discuss the result and issues of further development of Russian-Greek cooperation. Facing the creditors’ inflexibility, the government called the referendum as a ploy, hoping to use it as a mean to conclude an agreement with the EC, ECB, and IMF, whatever the result. Its ultimate objective was to get them to agree on a bailout package providing partial relief from repayments, along with a substantial debt write-down. The masochistic stubbornness the Syriza government shows in keeping shackled to the Euro at any cost can be understood by switching from regarding Greece as a country to regard Greece as a condition. Being Greece is simply the terminal stage on a road undertaken by each of the Eurozone member states. The Greece issue was among the topics of the ridiculous G7 summit in Bavaria last June. Though it was not necessary, the meeting proved one more time the EU leaders are nothing but vassals of a master overseas, and their sole task is do their bidding. The EU could do much to help Greece, and in a short time as well. It did hardly anything, but threaten financial havoc and social collapse, because Greece’s default consequences don’t bother at all. The EU is no family of equals, whose members help one another through difficult times. Rather than use taxpayers’ money to help Greece, the EU used it to destabilize Ukraine, a non-member state. This heinous and madcap act didn’t favor anyone but NATO expansionist policies. Therefore, Greece won’t exit from the Eurozone, let alone the EU. US hegemony is there to keep it well shackled – no free choice allowed. Washington’s interest is Greece to remain under full European control, as an essential country for strategic and geopolitical balance. Its plans don’t envisage power vacuums or not under control territories in the Mediterranean to benefit competitors – especially Russia, which would get to dock warships in Greek ports, very close to the Black Sea, Europe, and Turkey. And the Kremlin is eager to count on an EU member to exert its influence from within. Even China, currently engaged in intensive consultations to solve the crisis, repeatedly stated that the EU must safeguard its unity and Greece should stay in the Eurozone. The Eurozone will keep playing hardball. Even though the IMF itself admits some debt relief is inevitable. Even though Merkel herself, in an NSA spying released by Wikileaks, admitted back in 2011 that Greece’s debt was unsustainable. By keeping downright inflexible, the outcome would be Greece’s bankruptcy in a matter of months and the subsequent social collapse. European financial elite would present it as the inevitable outcome of Greek’s initiative and use it to deter other nations from following their example. The punchline would be no salvation outside the EU. Excellent analysis, Christian! I would like to hear your opinion about how the Greek situation is entwined with the proposed Russian Gas Stream. If the pipeline, after exiting Turkey, is forced to go through the eastern Balkan States of Bulgaria and Romania, which are more solidly under hegemon control (US and the EU), then obviously the US and EU would deprive Russia of any opportunity from deriving strategic political advantage from the pipeline. But since countries such as Macedonia, Serbia and to some extent Greece, which are more multi-polar, are more amenable to cooperation with Russia and the BRICS, having the pipeline transit their territories (a western stream) might provide Russia with some strategic opportunities to be gained from the pipeline. Christian, do you believe that, in part, the Troika’s forcing Greece to accede to its bailout terms is part of a strategy of ensuring its subservient status to the West, and hence foreclose any gains to Russia deriving from a western stream? As long as the EU, and thereby, the US, has Greece under its thumb, they can control whether Greece allows construction of a western stream on its territory. The straitjacket that Greece currently finds itself in, prevents any multi-polarity in its foreign policy. Interestingly, both Macedonia and Serbia, at this time are also facing actual or possible political turmoil.